We’ll be at the Somerville Winter Farmer’s Market this Saturday at the Center for Arts at the Armory at 191 Highland Avenue! We’ll have our usual range of wonderful castile soaps and also a selection of our “Keep Calm and Shop Local” tshirts, locally printed by The Art Shirt Company! Local and sustainable, delivered right to your home! 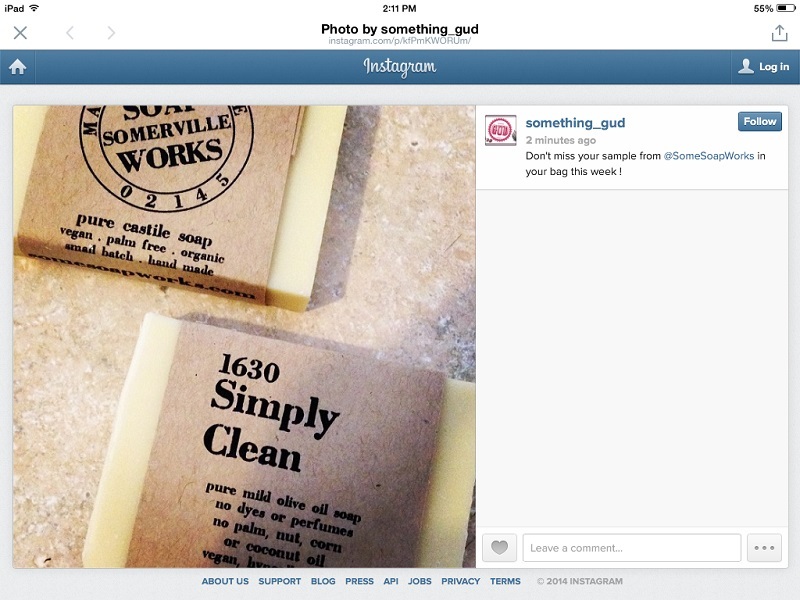 This week, local food delivery company Something GUD added Somerville Soap Works soap to the list of awesome stuff you can have delivered right to your door anywhere in the city! 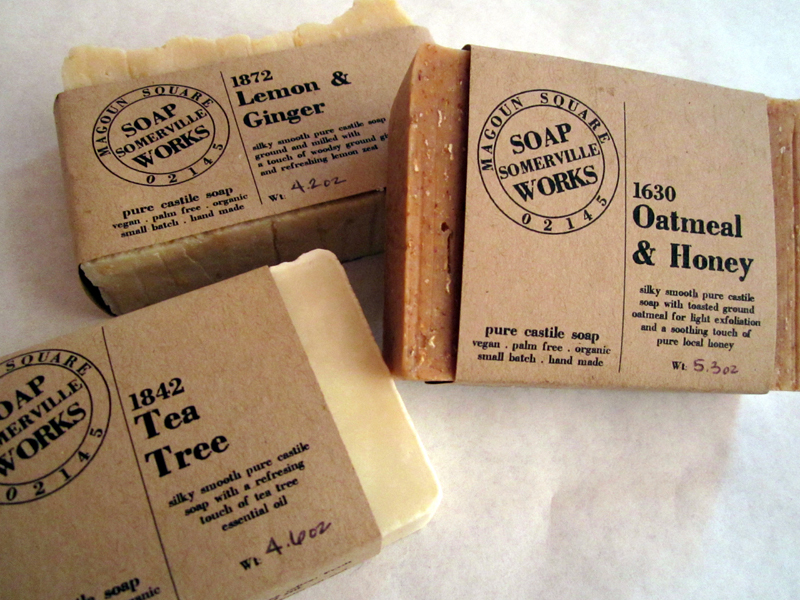 Box recipients got a sample of our 1630 Simply Clean soap to give it a try! We wanted to take just a moment to say hello and welcome to the Something GUD community, and to give a little more information on the soap than you can find on the label. I often get people coming to me to recount their own difficulties with allergies or chemical sensitivities, or their discomfort with the globalized, industrial food system, and the Simply Clean is my go-to option for those folks. There is nothing “plain” about it but you can’t get more basic than this one! 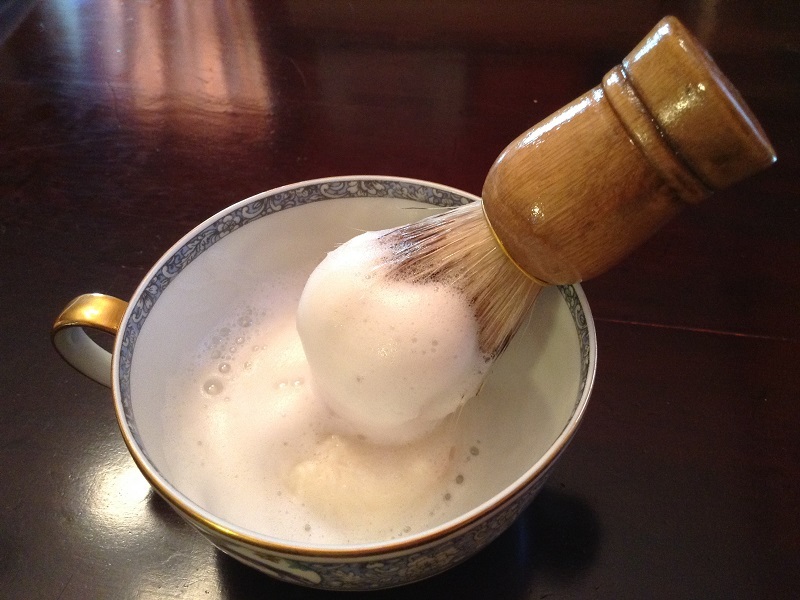 This is the simplest soap I make. 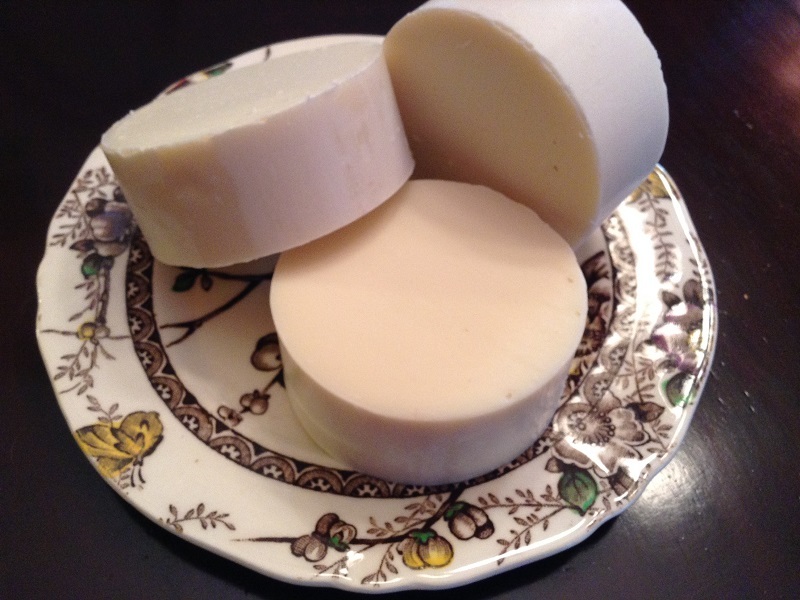 In its basic form, as my “Simply Clean” soap, it has only three ingredients: pure olive oil, and the distilled water and lye needed for the chemical reaction to produce soap. If you have allergies, or are concerned about a gentle soap to use on sensitive skin (like that of babies or those with chemical sensitivity), you can’t get more basic than this. With the benefit of modern chemistry, we are able to make precise calculations and exactly control the proportions of these ingredients, but in essence this is no different from the soap that humans have been making for millennia (we have evidence of this from centuries before human civilizations had developed writing, thanks to residues left inside clay pots and jars!). If you’d like to learn more, just check out the explanation of my soap lines, starting here with the first installment. Something GUD will be carrying two varieties of the 1630 soap: the Simply Clean, which is perfect for those who are looking for a pure, clean soap with no additives, preservatives, scents or coloring agents to irritate the senses or bring on an allergic reaction, the Oatmeal & Honey, with toasted ground oatmeal for a gentle but effective exfoliation and pure local honey to soothe and smooth after! For decades people have used oatmeal and honey for natural skin treatment, thanks to their many beneficial properties. 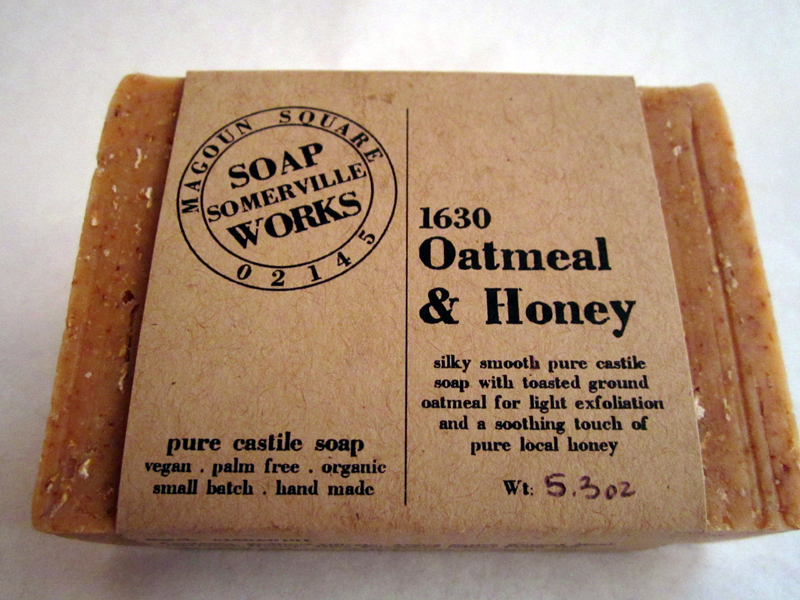 The 1630 Oatmeal & Honey brings both together for a great soap that even my friends with psoriasis and eczema report is gentle enough not to aggravate their skin! Both have the same lush, creamy, clean-rinsing lather that is characteristic of castile soap, and both use only pure olive oil to achieve that lather, avoiding the problems caused by coconut oils (which a growing number of people are allergic to) and palm or palm kernel oil (which many people find questionable due to the role played by large-scale oil palm plantations in tropical deforestation). So, welcome to the Something GUD community! We hope you enjoy your sample! After four rounds of development, and countless hours of research and testing, we have some news to report! 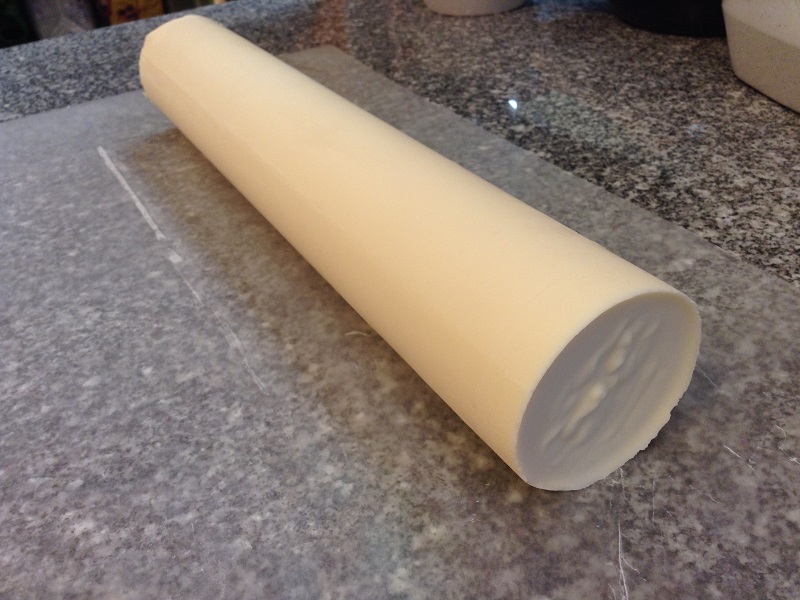 The first soap log (as opposed to the rectangular soap loaf) coming out of the mold! Yep, that’s the first batch of the finalized recipe for our shaving soap, coming out of the mold for making round cakes suitable for use in a shaving mug! After giving it an extra day or two to allow it to stabilize, we sliced it into individual cakes (each about 2.5 ounces) and set them onto the curing shelves to allow the water to evaporate and the cakes to harden. Well dried soap will hold up better to use and last longer than the fresh stuff, and I like to make sure that all my soap has at least four weeks to cure and dry before wrapping. I might give these just a bit longer on the shelves, as they include a couple of extra ingredients to make them just perfect for use in shaving, whether with blade or electric. The final recipe is wonderful: full of luxurious, thick lather which builds up quickly and lasts through an entire shave thanks to the rich olive oil and the addition of just a bit of castor bean oil. As those who have made the switch will already know, pure olive castile soap (weird to have to add that qualifier, as castile soap is *supposed* to be made only of olive oil!) starts out well-suited to shaving because the lather is smoother and creamier, more like a lotion than a typical bar soap, and much less likely to strip the moisture out of skin and leave it feeling dry and flaky. Just look at all that lather! Imagine how much better it would be if I were a bit more skilled with brush work – it really is an art! Add a bit of castor bean oil and the experience becomes extra-luxurious, as the castor bean oil works like coconut oil to build thickness in the lather, but without the drying and the allergen content. Another benefit of castor bean over coconut oil is that the lather isn’t quite as fluffy and bubbly; it’s richer and heavier, much closer to a lotion or cream than other soaps, not to mention that sticky stuff that comes in an aerosol can! This is much more likely as well to cling to the skin and the base of the hair or whiskers, producing a smoother and more comfortable shaving experience. 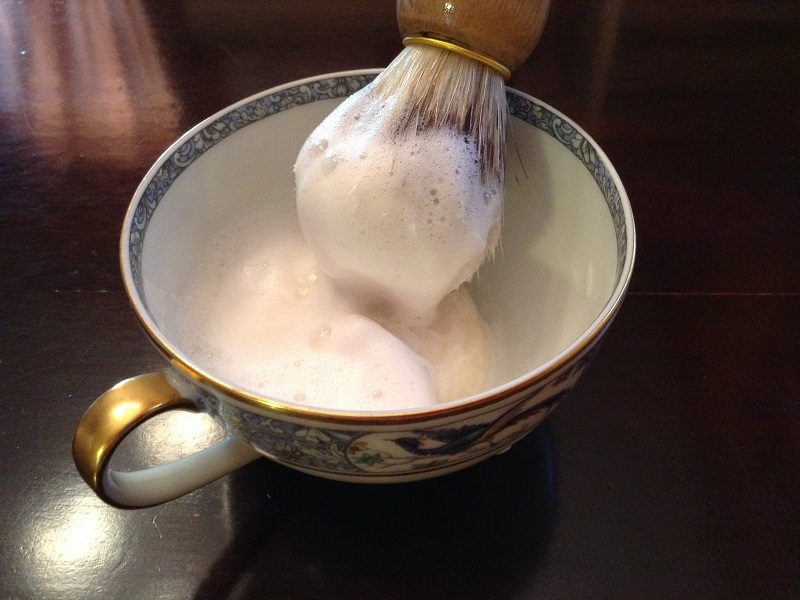 It works just fine for scalps and legs, too, with or without a shaving brush! One of the things I like most about this recipe is that I’ve worked to balance the oils with a generous helping of 100% pure aloe vera, which helps in two ways. First, it works with the olive oil to further smooth the path of the razor, preventing razor burn. Nothing is worse in a shave than a razor that pulls or scrapes the skin, and the extra-humectant properties of the olive oil get a good boost from the aloe so that the razor glides along! Let’s face facts, though. Shaving is inherently gonna be a bit irritating to the underlying skin, even in the best of circumstances. The aloe vera I’ve added helps with this as well, because unlike those soaps that contain only just enough to be able to get a bit of label-bling, we’ve tested and retested until we had the highest possible percentage of aloe to provide a soothing, cooling touch to the skin for after the shave, minding the delicate balance between having enough to really notice the effects but not so much that the resulting product will be too soft to cut and handle. I’m really happy with it, and I can’t wait to share it with you! What’s with all the numbers, part three! My 1872 soaps are some of the most fun I can have in terms of experiments! In all processes, especially those which involve some measure of trial and error experimentation, you are going to have some failures. I’ve had plenty, including one early in my soap making experience, when I didn’t insulate a mold properly (the chemical reaction which turns oil, water and lye into soap puts out a lot of heat and you have to keep it warm until the reaction concludes). The resulting loaf of soap looked horrible! It had a thick rind on the top from where it had cooled faster than it had cured, and though it was chemically fine (the reaction had finished and the resulting soap was only just slightly more basic than neutral in pH), I had no illusions that anyone would want to actually use it. Doing some research on what to do with my ‘failed’ batch, I discovered the process of “rebatching”, or remelting and remixing a finished batch of soap to try to fix errors or problems that come up in the initial cold process reaction. I was surprised to find out during this research that many ‘soap makers’ do not in fact produce their own soap base. Granted, the idea of working with lye can be daunting for some people, and plenty of folks only want to make a small amount of soap customized for themselves or to give as gifts, and so they buy a premade soap base, grind it up, melt it down, and mix it with a customized recipe of ingredients (colors, scents, and other elements) before pouring it into molds. This “melt and pour” process does have advantages: since the ingredients you will be adding don’t have to survive the cold process reaction (which can produce heat in excess of 200*F) you don’t have to worry about the scent being “cooked out” of an ingredient, or having the color changed by exposure to heat. The limitation of buying a premade “melt and pour” base is that you can’t change, and might not even be able to know, what is in that soap base. 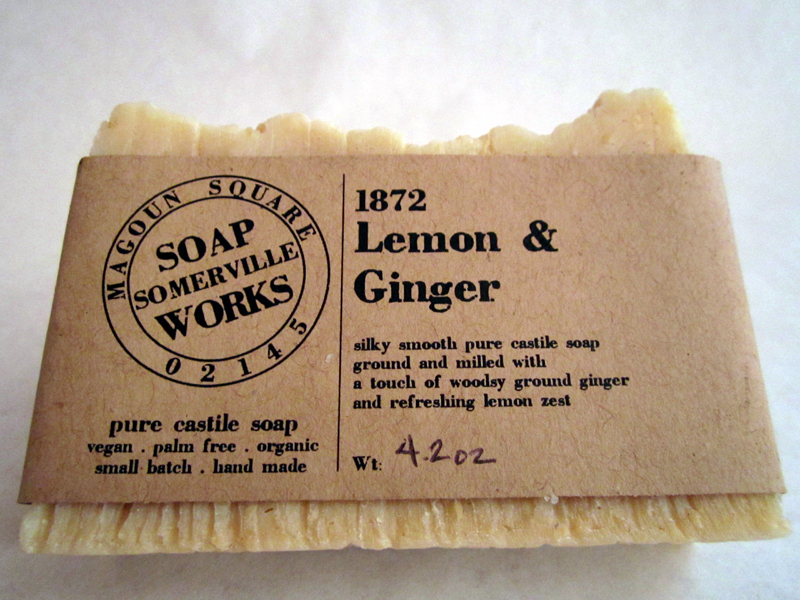 Soap is rather loosely regulated by the FDA, and many companies who produce soap bases follow the letter of the law, rather than its spirit, and provide very little information on their labels. Again, there is nothing necessarily or inherently wrong with this. Companies are allowed under the law to protect their recipes as trade secrets. The only trouble you get into is when you have allergies or sensitivities and have to be doubly and triply sure not to come into contact with something that will trigger a reaction. I’m in favor of an exhaustive listing of components because I’m one of those people who reads and researches labels carefully, and I have still been burned (literally!) by a product whose manufacturer did not list all the ingredients. My soap “failure” provided me with the perfect opportunity to try making melt and pour soap on my own terms, using a base that I could feel absolutely confident about. I started with my own pure olive oil castile soap, ground into flakes, and tested a variety of added liquids to see which provided qualities I liked. It’s been a lot of fun to experiment, and provided me with an amazing range of new possibilities that I’ll write about here in future posts. 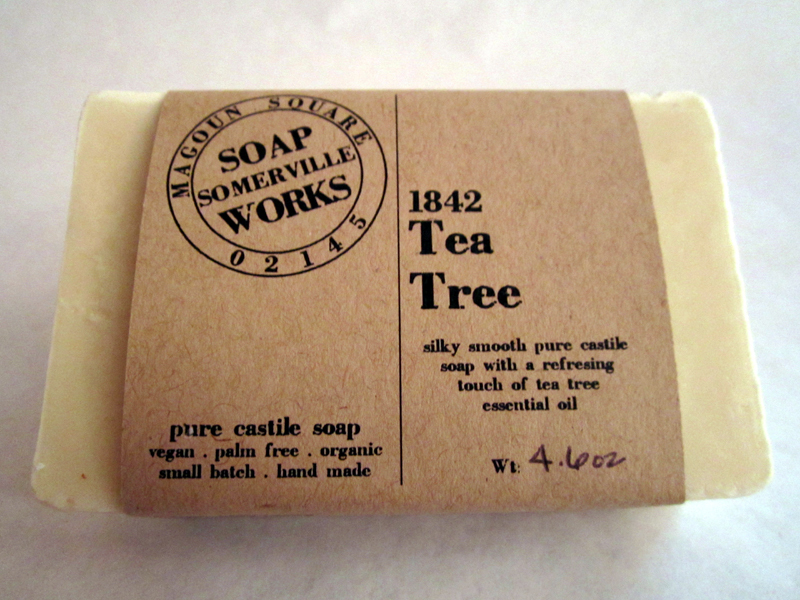 The simple key I use to refer to these remilled soaps is 1872, the year that the residents and government of the town of Somerville decided to mix everything up and reincorporate themselves as a fully fledged city. I could think of no better analogy for this decision to take what the process gave me (the good with the bad), put in a bit more hard work and inspiration, and reintroduce it to the world as brand new and better than ever! What’s with all the numbers, part two! Today, we press on with part two: the nineteenth century! Once I had my basic recipe settled, I turned to experiments with other oils to see what benefits they might offer. Some I decided not to work with because I wasn’t comfortable with the questions raised by their cultivation or production methods. Others I quickly discovered would cause an immediate allergic reaction, often before I’d even finished mixing the raw soap. Perfume oils are highly problematic, because even though the FDA has relatively stringent requirements as to how ingredients must be listed on the labels of products, perfume and fragrance blends are considered trade secrets and so, though there may be anywhere from two or three to hundreds of individual compounds making up a scent, those components are not required to be listed individually. There’s nothing inherently or necessarily wrong with this, but for those of us with chemical sensitivities, it’s just too big of a risk to take on a potential adverse reaction if we can’t be sure what’s in that compound. With essential oil, you can be a bit more confident in your choices. FDA regulations differentiate perfume oils from essential oils based on their contents. While perfume oils can contain anything from compounds directly extracted from a raw natural source to compounds produced wholly in a laboratory, essential oils can only be, they *must* only be, the volatile compounds extracted from a flower, leaf, root, or seed of a plant. Methods of extraction differ, so it is still necessary to be careful when selecting an essential oil to work with, but steam or expression are the most common extraction methods. As a result, you are left with only the pure “essence” of the plant involved, rather than a blend of essences with other chemical compounds. Still, some folks do react to essential oils in products, and so I wanted to have a distinct and easy to recognize key to help customers know when something more than just olive oil is in that bar of soap. Sure, I list the essential oil on the label in both the description and the listing of contents, but I wanted a way for the difference to be clear at a glance. I’m a bit of an absolutist when it comes to labeling. Put it all out there, do the work of educating your customers on your methods and values, and then let them decide. The other side of the caveat emptor coin is that the emptor must be provided with all the information necessary to make an informed choice. The nineteenth century was a period of time when many traditional handcrafts (like the production of essential oils and soaps) began to be reinterpreted through the lens of industrial production, systematizing their manufacture (for good and for ill). It made sense that, if I were going to continue to use dates to differentiate my lines, a nineteenth century date would be appropriate for a soap which included another oil, one extracted and refined using modern methods. And it helps that I had a mid-nineteenth century touchstone in the date 1842, which is the year that Somerville was incorporated as a town in its own right, distinct from Boston and Charlestown. Next up: the exciting conclusion to our “what’s with the numbers” series! What’s with all the numbers? And even though I’ve started up the Etsy site, most of my selling happens in person, where I can talk about the process and the values I rely on to guide how I source my materials and plan what to try next. I love being able to meet people at a fair or a farmer’s market to share what I’ve learned and answer the questions that people have. It comes in many forms and varieties, and it isn’t always the first question people ask, but invariably I get it from all manner of folks: customers, market organizers, other vendors, even the guy who came in to service the water heater. When I first started out testing my own soap recipes, I had to come up with an easy way to differentiate them based on their contents. I knew from experience that some oils were not an option for me because of allergies, but there were others I definitely wanted to try, and I needed an easy way to track all the mixtures, a way that included a convenient shorthand to refer to them, making it easier to write on a post-it note or in a spreadsheet. Perhaps because of my love for local history, the idea of using dates just seemed natural to me, so I assigned the dates based on how simple or advanced the recipe was. Over time, I tested each batch and weeded a fair few out: either because they caused a reaction or because the final result didn’t live up to my hopes and expectations. Eventually I was left with a few key variations. My favorite of the 1630 line! And why the date 1630? Well, again, I love history and the history of Somerville in particular, which was settled in …you guessed it… 1630 as a part of Charlestown! Next up: the nineteenth century!